Instant Imprints Oakwood, GA | Custom T-Shirts, Embroidery, Signs and More! At Instant Imprints Oakwood, our customers come to us when they want to be more visible to their customers. We create that visibility five different ways: Branded Apparel (embroidery), Signs & Banners, Promotional Products, Custom T-Shirts and Print Services. Instant Imprints serves Gainesville, GA and surrounding areas. I needed some name plates for trophies at the last minute and Instant Imprints in Oakwood was great! Tom was very accommodating and created the nameplates from what he had in stock. They were fast and looked terrific. Is your Oakwood business looking to take its brand visibility to the next level with custom t-shirts, printing services, promotional products, custom banners or branded embroidery items? Then look no further than Instant Imprints! We have everything you need to create promotional products of all kinds for your next event or product push. Our Image Experts are happy to help you every step of the way and get your job done right, all under one roof, right here in Oakwood. Just ask your phone, “What’s the best print shop near me?” You’ll surely find your way to Instant Imprints! Our print shop brings together the best of both worlds: you get the quality and value of a global industry leader combined with the local, personable touch of a Georgia Image Expert. That makes our service second-to-none, with the latest production technology and the expertise to use it right. We pride ourselves in getting your project completed on time, and getting it done right the first time, which helps you avoid costly revisions you may have to endure with home or office printing attempts. When you need your job done right, Instant Imprints is your source in Oakwood! Custom t-shirts are powerful ways to get your brand the visibility it deserves. No matter where your custom tee travels, your brand values will be traveling with it, around Georgia and beyond. You can make an impact on potential customers by gifting your tees at giveaways, or you can put them up for sale so that your most loyal customers can show their support. Whatever promotional strategy you use for your custom tees, it’s important that they’re of the highest quality. Custom t-shirts from your Oakwood Instant Imprints are sure to turn heads wherever they go! 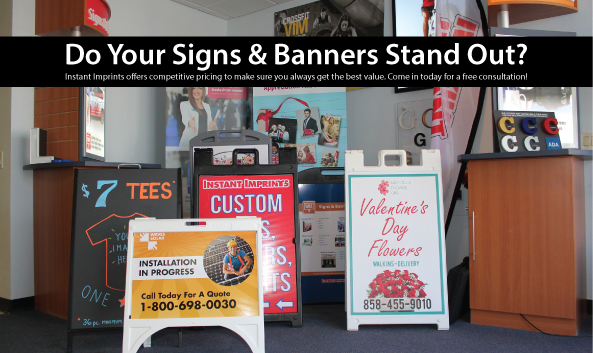 When you want to stand tall, far above the competition, custom signs and banners are the way to go. Whether you want to decorate the sidewalk or the skyline, our custom sign service is sure to attract potential customers. The durability and portability of a custom banner means that you can put it to work for you wherever its most effective, indoors or outdoors. How about a new trade show display to impress your colleagues at your next industry conference? When you’re ready to put your logo to work, stop in at our Oakwood Instant Imprints Center on Mundy Mill Road, give us a call at (770) 535-0722 or request a quote online today! Monday – Saturday: 9 AM – 6 PM.